Gladinet Cloud Enterprise is an industry leader in Enterprise File Sync, Share and Collaboration solutions. 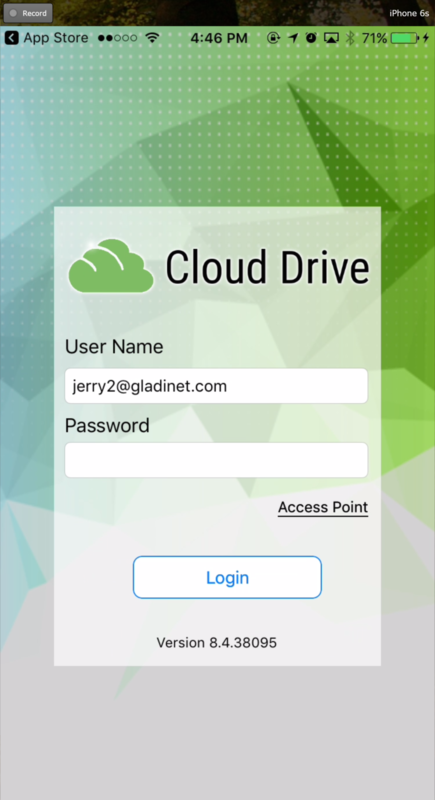 Users can access Gladinet cloud files using any device of their choice as Gladinet has clients for Windows, MACs, iPhones, iPads, Android, Windows Phone 8 and many more. 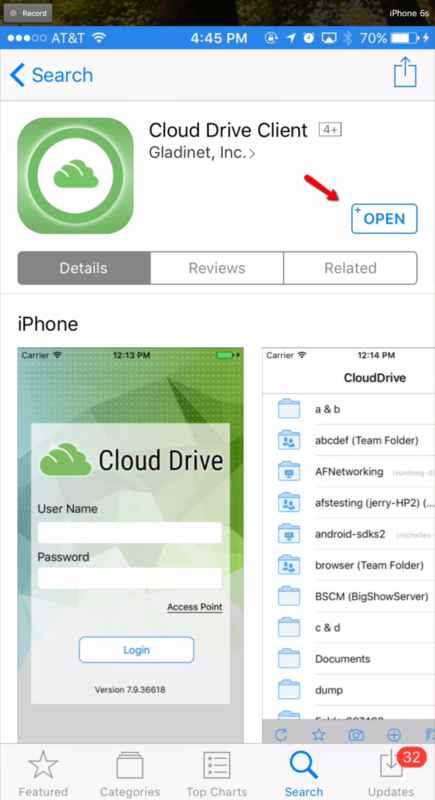 Gladinet Cloud iPhone application is a native iOS application available in App Store that users can use to access Gladinet cloud files and folders. The iOS Gladinet Cloud app requires IOS 6.0 or later and is compatible with iPhone, iPad, and iPod touch. 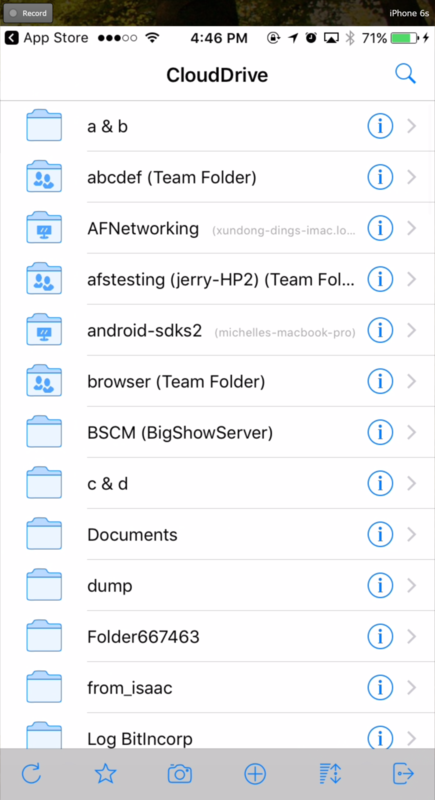 There is also a white labelled Gladinet Cloud iOS app called ‘Cloud Client’ by Gladinet that can be distributed by service providers and enterprises to their users. 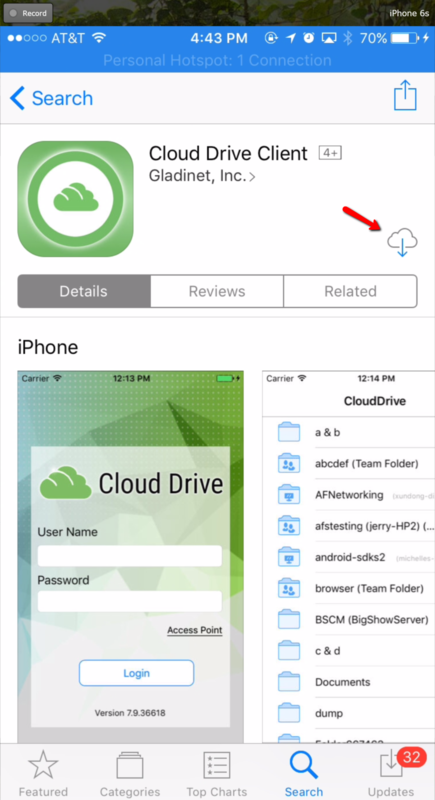 The user guide is a useful source of information and describes in detail the full functionality of Gladinet Cloud iOS application. Search for Gladinet Cloud in ‘App Store’ to start the download and installation. After the install click on ‘OPEN’ to access the Gladinet login page. Login using your credentials. 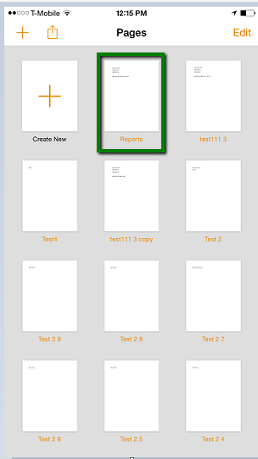 Once logged in users will see the files and folders they have access to like shown in the screen below. 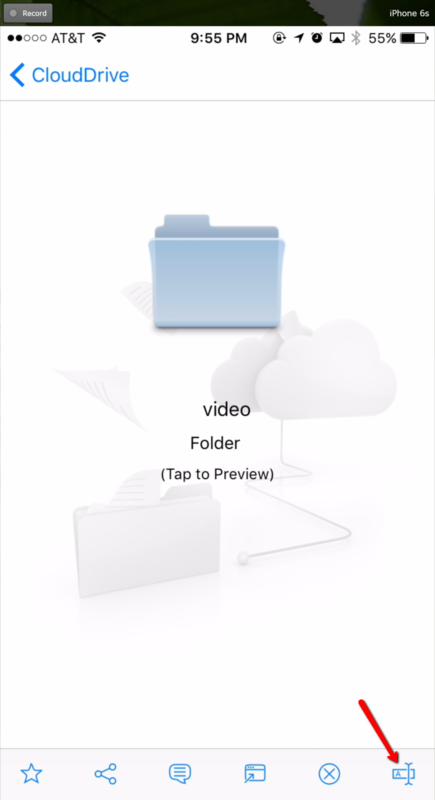 Tap on the folder to see the files and sub-folders inside. Clicking the ‘i’ circle icon for a folder will display editing and collaboration options for that folder. The editing and collaboration options are ‘Favorite’, ‘Share’, ‘Comment’, ‘Open In’, ‘Delete’, and ‘Rename’. Tapping a file will also display the same editing and collaboration options as show for the folder above. 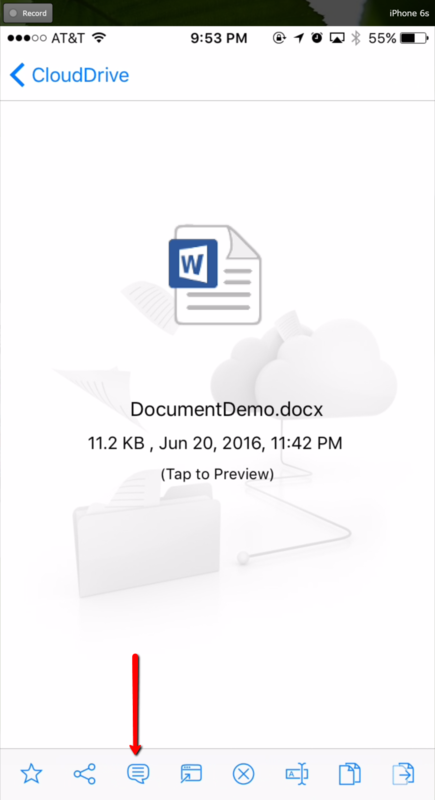 To access a file tap on the file name and you will be able to view the file and the context menu. One can also open a file by just tapping twice on the file. 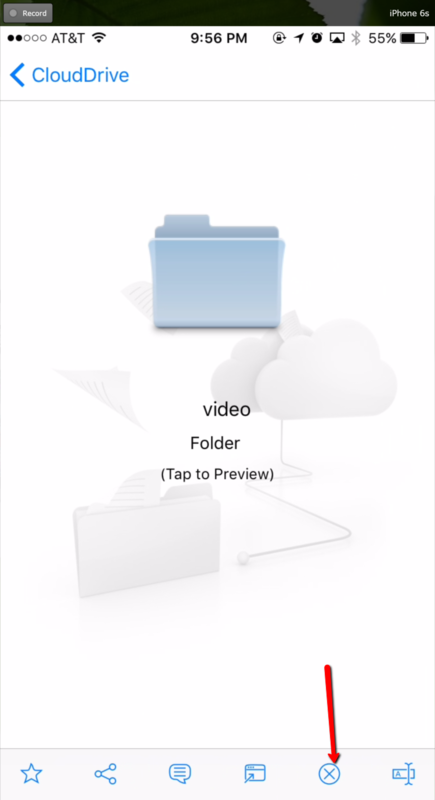 In order to create new folders a user can click the ‘+’ (plus) icon displayed on the bottom of the screen. 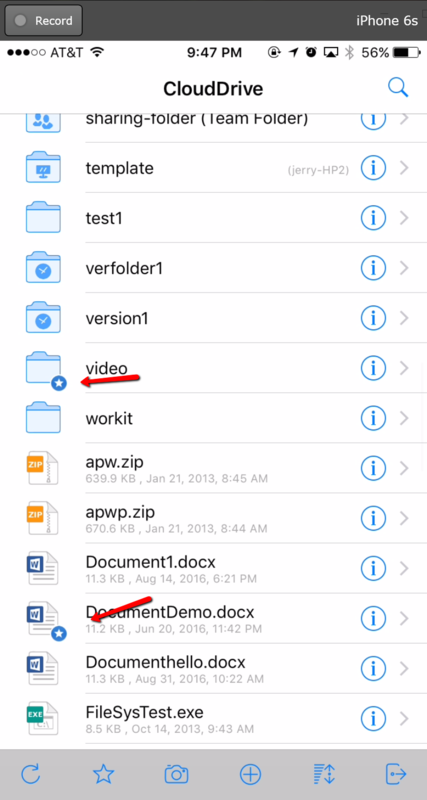 After entering the folder name and clicking the ‘OK’ button will create a new folder. Selecting the camera icon will allow users to either upload an existing phone or take a new photo. To take a photo or to choose an existing photo to upload select the camera icon on the bottom of the screen and select ‘Take Photo’ or ‘Choose Existing’. Files and folders which have been added to ‘Favorite’ are available for offline access. 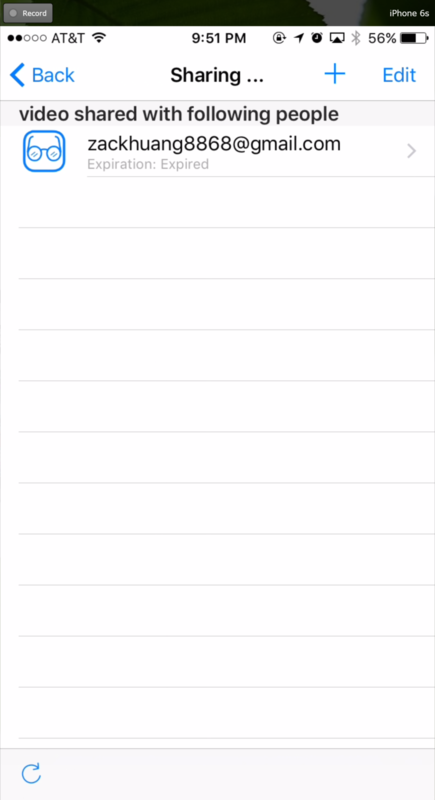 You can access the files and folders in ‘Favorite’ when offline. 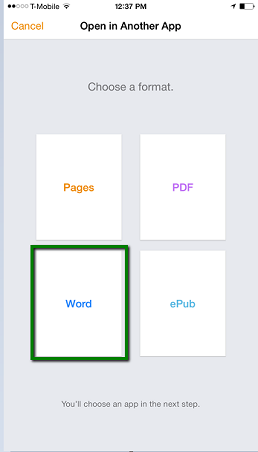 Selecting the open book icon displayed in the picture above will open the ‘Offline Favorites’ folder which will show all the files and folders that are available for offline access. 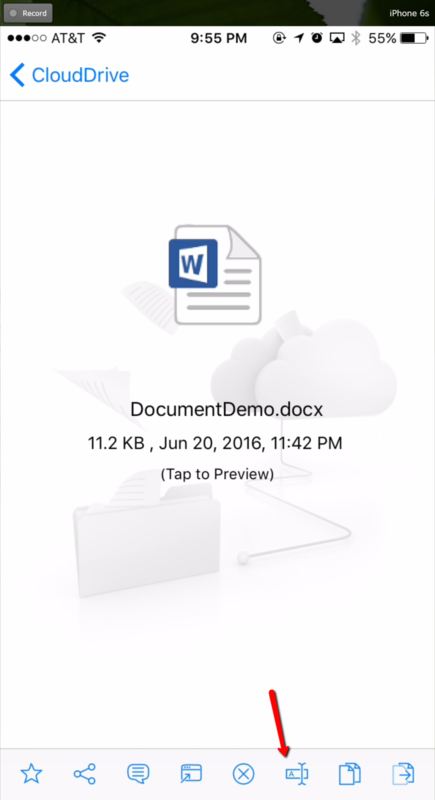 To edit an existing document, tap on the document in the file list. You will be taken to the edit and collaboration screen. where you will select ‘Open In’ option. Select ‘Open in Pages’ to edit the file. 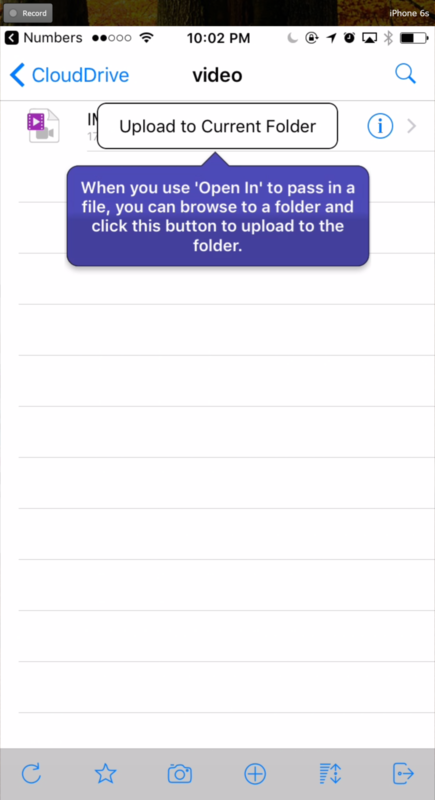 When you select ‘Open in Pages’ you will see a message window, ‘this document may look different on your IOS device’, select ‘OK’ and select the file you want to edit. Edit the file and select ‘Done ‘to save. 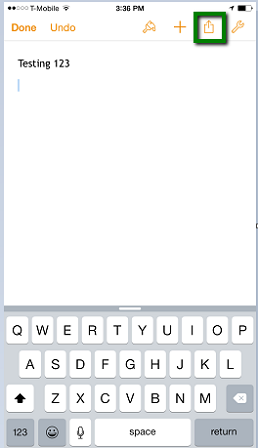 Any changes you have made will be saved and you can tap the document again to return back and continue editing. NOTES: iOS applications are sandboxed by default, meaning they don’t have a way to access other application’s data. 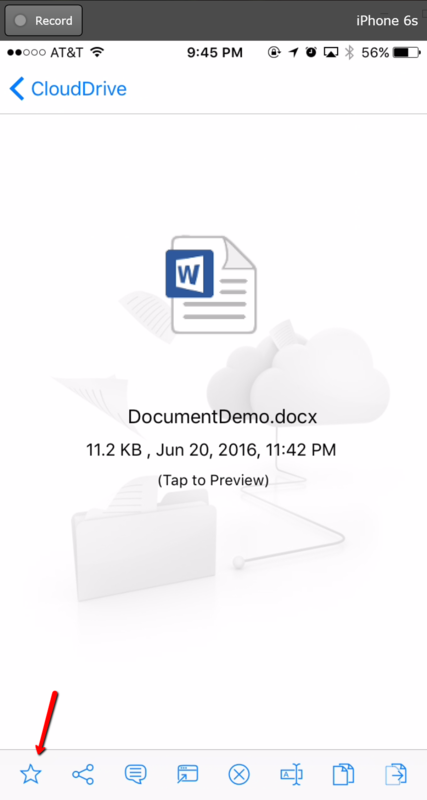 So when an external application edits the document, the document is saved to that external application’s isolated (sandboxed) storage location. 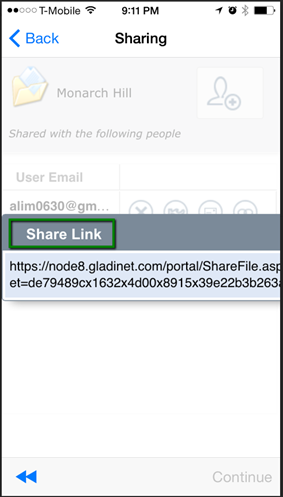 Many external application supports “SHARE” or “OPEN IN” so you can use the Share or Open In to send the document back into Gladinet iOS application. Select the document you want to edit. 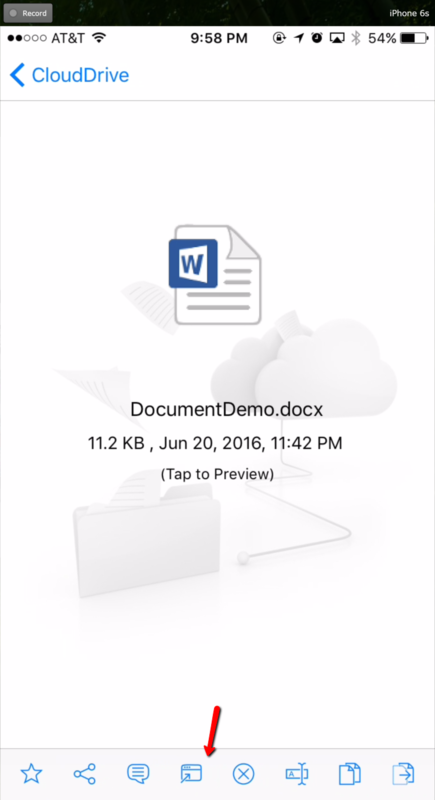 Edit the document and select ‘Done’ and then select the ‘upload icon’. Choose a the file format. Select ‘Open in Gladinet Cloud’. To refresh any screen, select the refresh icon on the bottom of the screen. 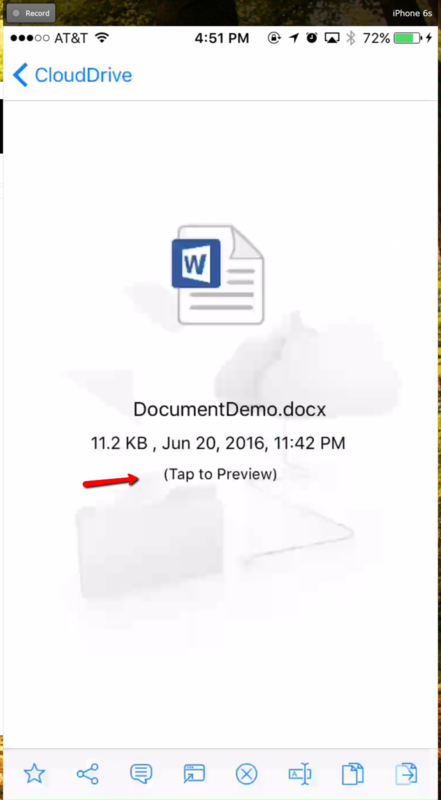 In order to preview a document or a folder, you can press the ‘Tap to Preview’ option listed under the document or the folder. You can add a file or a folder to favorites by pressing ‘Favorite’. 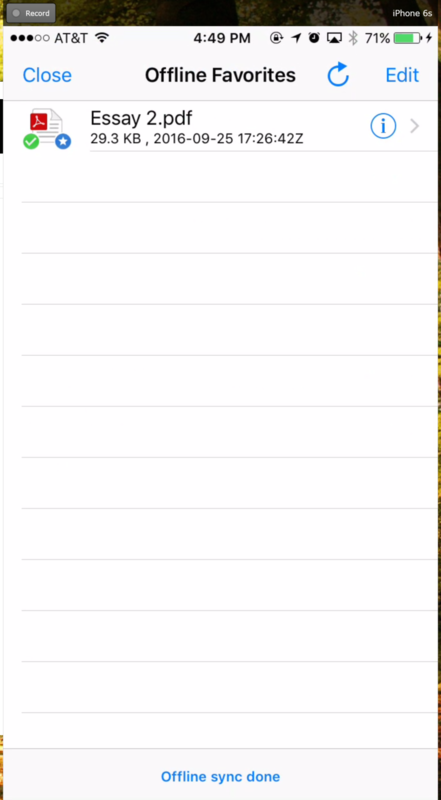 When you add a folder or a file to favorite, it will be marked with a ‘Star’ and you can access them offline. 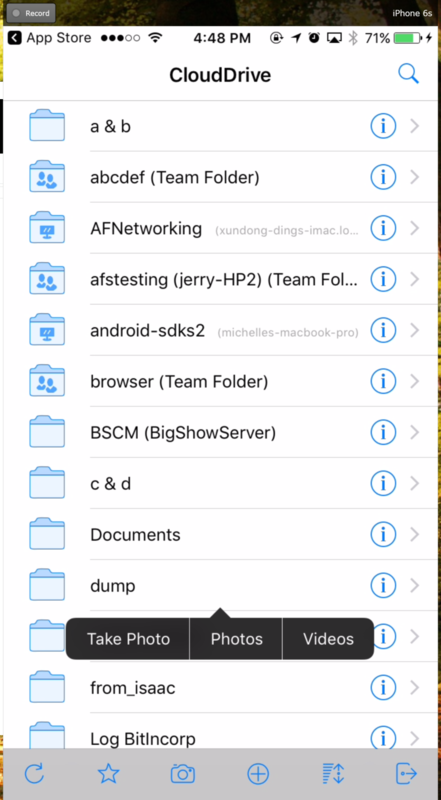 You can remove the folders and files from favorite by pressing ‘Unfavorite’ for folders and files which were added to favorite earlier. Once the files or folders have been removed from favorites they will no longer be marked with a star and will not appear under ‘Offline Favorites’. 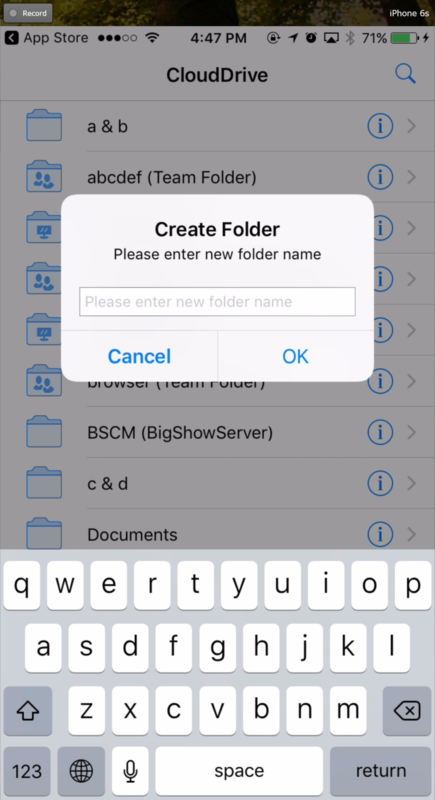 You can select the files or folders that you want to share even from your iOS devices. 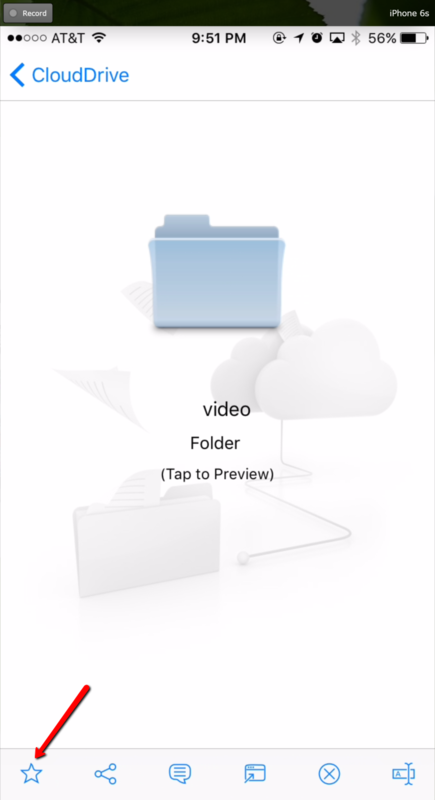 Pressing the ‘Share’ option for the files or folders that you would like to share will take you to the sharing window where you will be able to add the users with whom you want to share the contents. Press the icon to add users to the share. Once user’s email has been added press ‘Continue’ on the bottom right of the screen. The options to share are ‘Continue as it is now’ or ‘Add user as a guest user’. When selecting ‘Continue as it is now’ option a user will receive email invitation to the shared documents and will have read-only access inside a web browser. 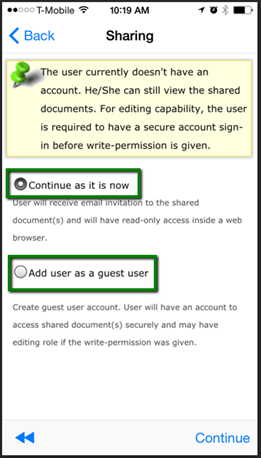 When ‘Add user as a guest user’ option is selected during sharing this will create a guest user account and the user will have an account to access shared documents securely and may have editing role if the write-permission was granted. When the sharing option has been selected press ‘Continue’ on the bottom right. You can set expiration time to protect the share by specifying share expiration time if you selected the ‘Add as a guest user’ option during sharing. ‘Continue as is it now’ option does not allow to specify expiration time as the user can have ‘View/Read-only Access’. Once a guest account has been created for a user, the user can be given read-only or full access. 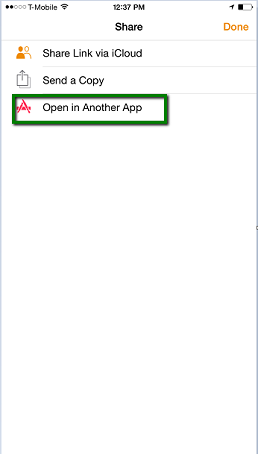 Full access have read as well as write permissions. 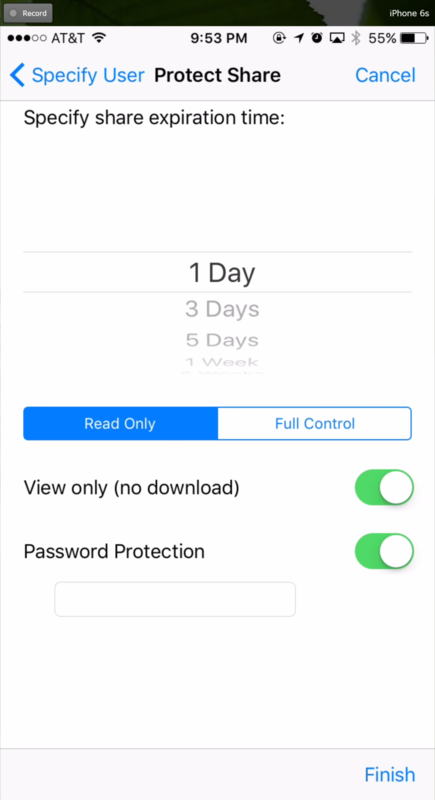 You can also protect the share by choosing ‘Password is needed to access’ option in which case users can only open the shared documents by typing in the correct password. The user will receive the password in an email and will have to use that password to access the shared folder or file. If you choose ‘No Protection’ in which case no password will be required to access the share. The user initiating the share can also enable ‘Send email notification when file is downloaded’ and ‘Send email notification when file/folder is changed’. 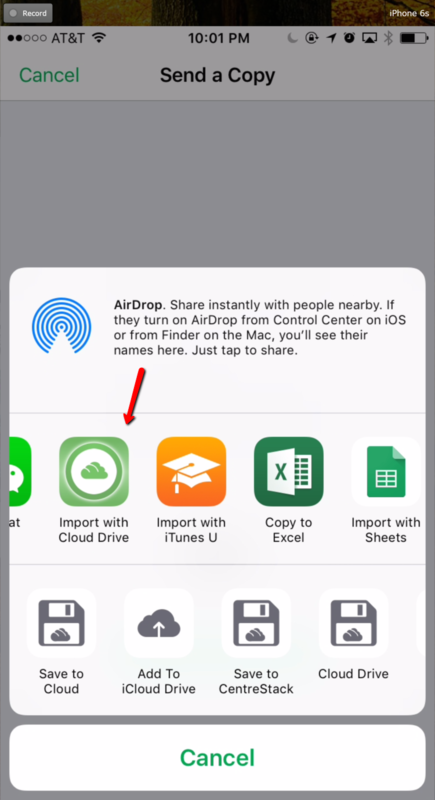 With these options enabled, the user who initiated the share will receive email notifications every time the shared file is download and will also receive email notifications whenever there are changes to the shared file or folder. 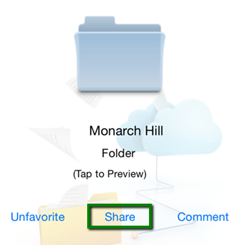 Select ‘Share’ for a shared folder or file to access the shared objects screen. 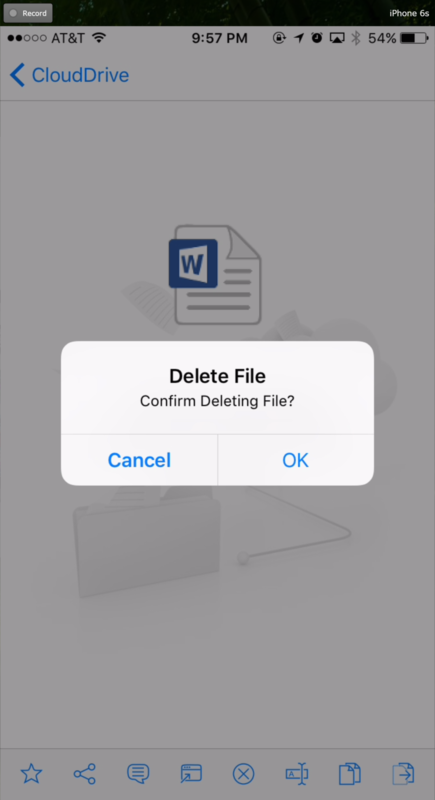 Delete – You can add or remove the users with whom you want to share the documents. 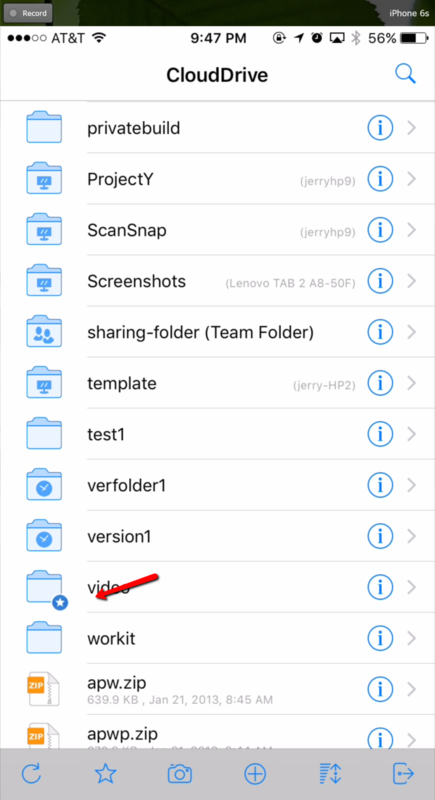 Edit Share – You can edit existing share permissions using ‘Edit Share’ option. Email Again – You can press the envelop icon and email the users again. 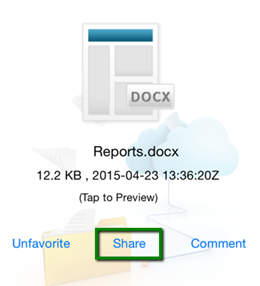 Show Share Link – You can press this option to enable the public link for the share. The public can be send to users in an email to access the share. 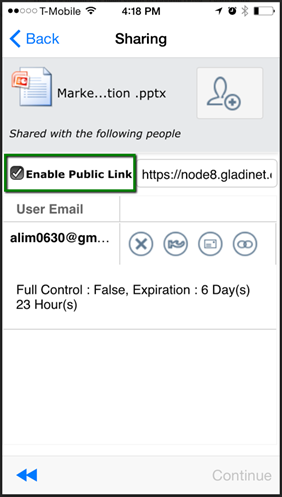 ‘Enable Public Link’ box should be checked in order to allow users to access the share using the public link. 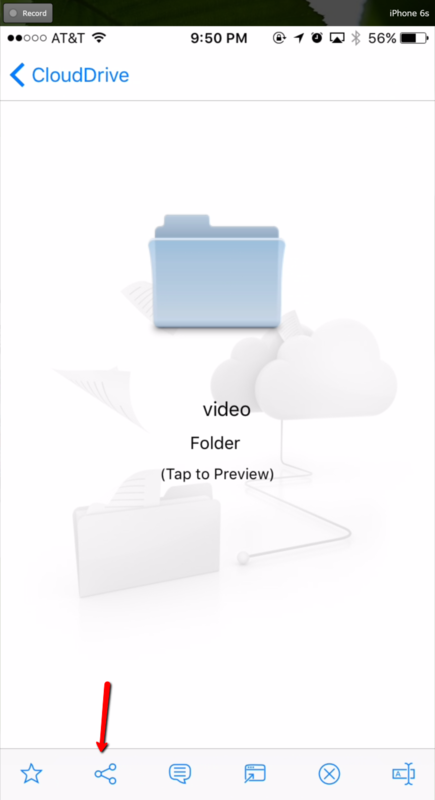 You can add comments to the shared files and folders. 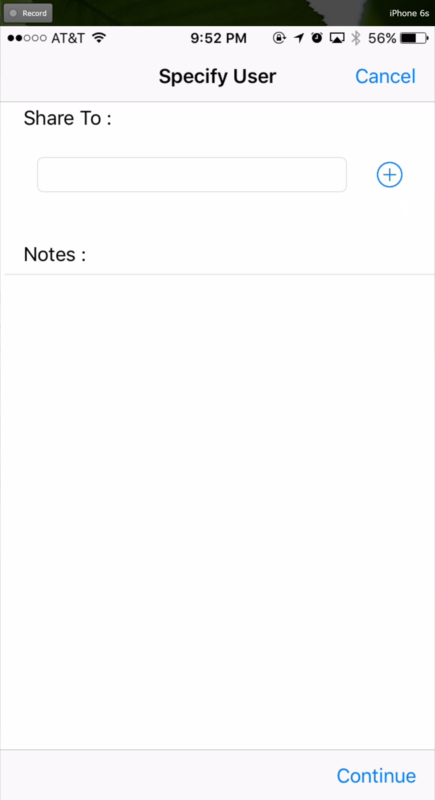 Comments make it easy to track and monitor the shared contents. 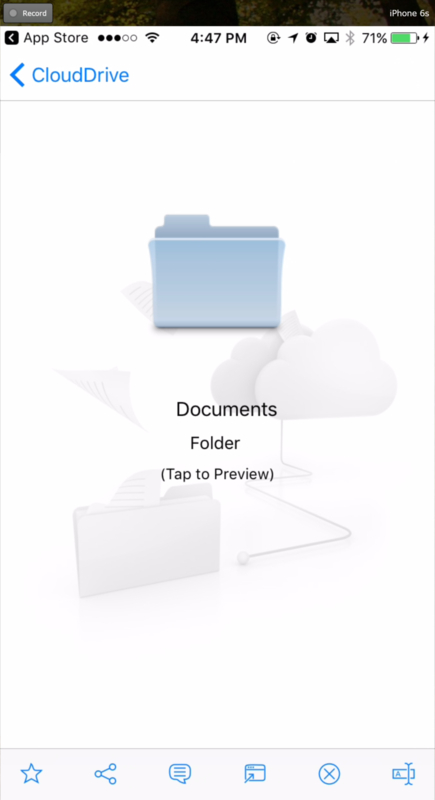 Press ‘Comment’ to add comments to your files and folders. After pressing comment you will be show a field where you can enter comments. 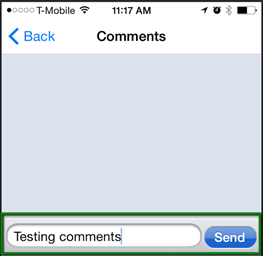 After adding comments pressing ‘Send’ will add the comments. 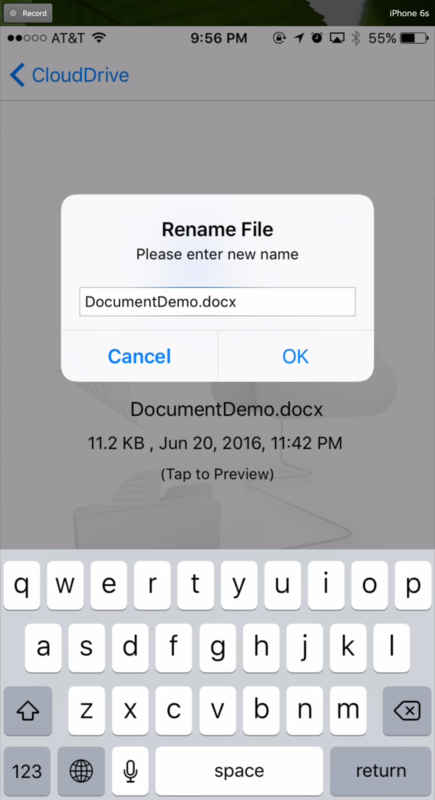 You can rename a file or a folder using the ‘Rename’ option. 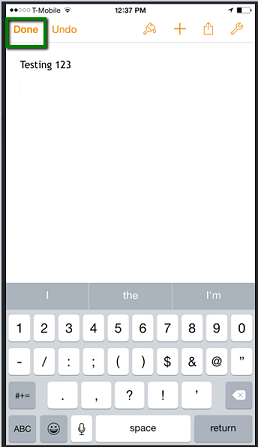 Pressing ‘Rename’ will display a field to type in the new name. 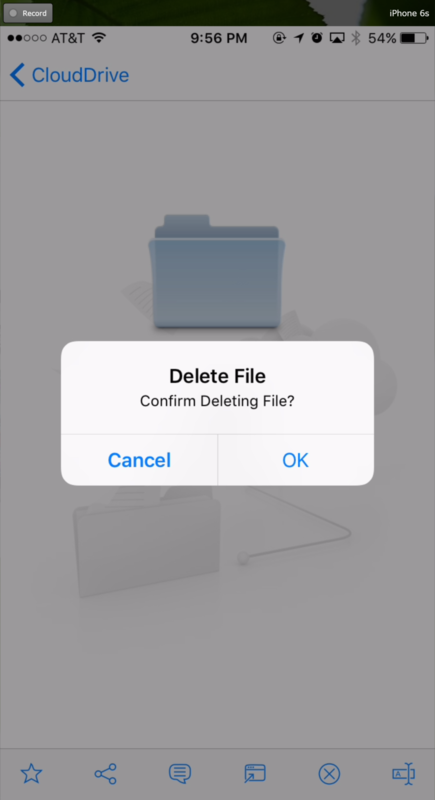 A folder or a file can be deleted using the ‘Delete’ option. 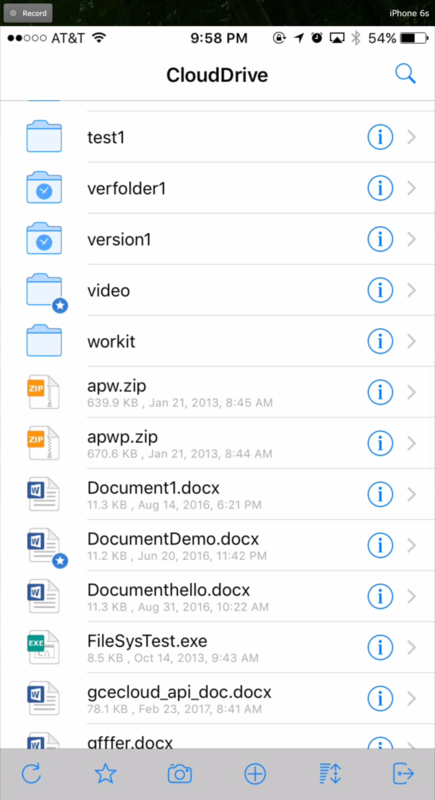 Select ‘Delete’ from the context menu to delete a folder or a file. 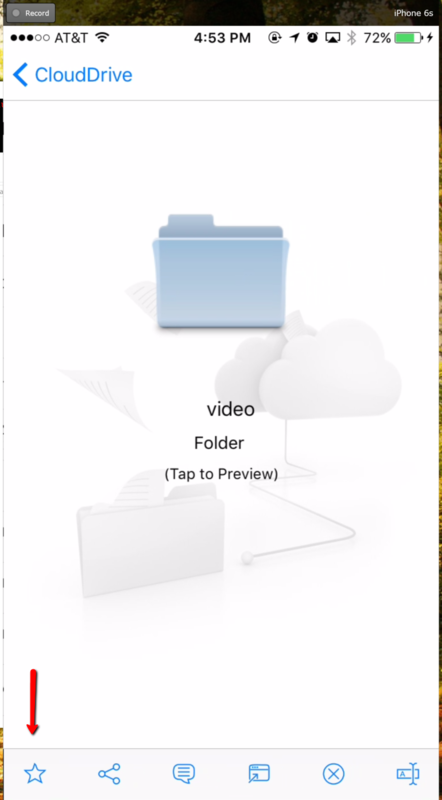 Once the file or folder has been deleted it will no longer be visible in the cloud drive. You can logout from the Gladinet cloud by pressing ‘Logout’ at the bottom right of the screen. Gladinet’s vision is to enable secure access to enterprise data from anywhere using any device including mobile devices like iPhones and iPads. The iOS Gladinet Cloud application is feature rich which allows enterprise users to not only access the data but also sync and collaborate on that data. 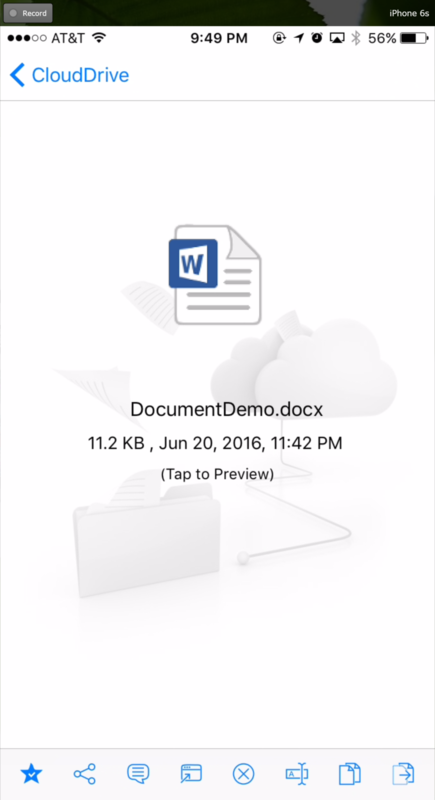 Users can access, share, edit, and perform other functions on the data when accessing from iOS devices just like they do when they access it from Windows or MAC clients. © Copyright 2015, Gladinet, Inc..